A barbeque is never just ‘a barbeque’ – it’s a celebration. For many of us, you just can’t beat a good old fashioned barbeque. Nothing compares to cooking over charcoal – the flavour, the smell, the theatre! If it’s not in sight, you can’t help but feel as though you’re missing the show. So, like moths to a flame, you crowd around it, offering up average advice and firmly asserting yourself as Number #1 Cooking Supervisor. And so the fun begins. And now you’ve got the crowd, you better get cooking! How do you like your steak burnt? Just kidding.. Here are our HOT tips to get you grillin’ and chillin’ in no time. You could even have a few bites under way. At the very least, your guests will be impressed you could light it! Have everything in place and ready to go. Marinate the day before and prepare as much as possible to ensure you get to enjoy the party too. Work out how many batches of food need cooking. How will you keep raw meat separate from cooked? 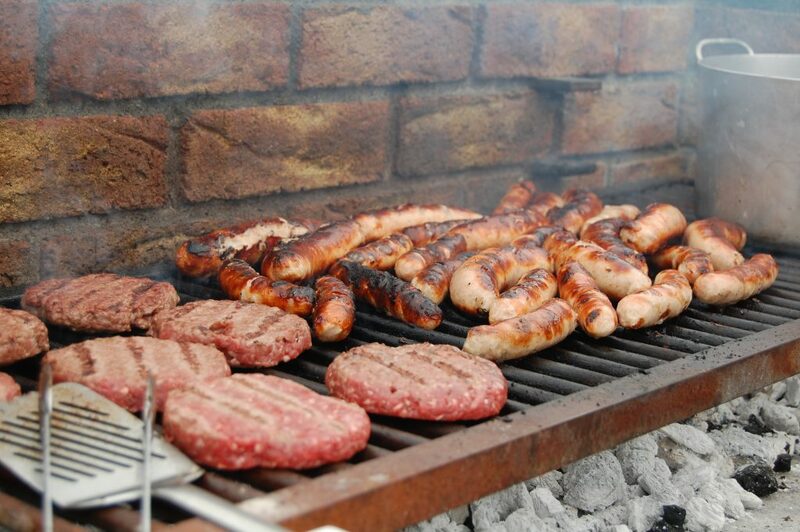 As long as the barbeque is on, you should stick around; for the most delicious results and for safety’s sake. Don’t worry, you won’t get lonely. You’re never more than a few meters away from a barbeque expert at something like this! The summer months, when most barbecue bones are tickled, coincide perfectly with seasonal vegetables like sweet corn, courgettes and peppers. Veggies are a great addition to any barbeque, complimenting both meats and salads. Have you ever tried some thinly sliced sweet potato on the grill? It’s ahhhmazing. You should always cook meat from room-ish temperature, so if it’s in the fridge, take it out at least 20 minutes before cooking. If it’s too cold in the centre, the outside may well burn before the inside is cooked. Using a small blade, cut into the centre of the meat (to the bone if possible), to check the flesh is cooked and juices are running clear. For flaky fish like salmon, press down on the flesh to make sure the flakes come apart, this means it’s ready for devouring. Some might say resting the meat is the most important step. This allows the juices to be reabsorbed and your meat will taste a whole lot better for it. Rest in foil away from direct heat, a warm tray on the top rack or somewhere similar would be ideal. And there you have it, you are now licenced to grill. Stay tuned for some marinating magic later on this week.